By definition, superheroes are larger than life, courageous, powerful, and seemingly able to overcome any obstacle with great physical powers while doing great deeds at the same time. Young children, facing the challenges of learning many new skills, may often feel small, fearful, or troubled—in other words, just the opposite of superheroes. 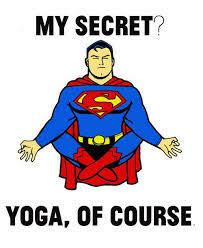 Through combining yoga and art with a Superhero Theme, we will encourage children of ALL ages the freedom to feel brave, fearless, in control of their world, outside of ordinary, and just plain good.